At the ripe young age of seventeen, Nym is already experienced in being bought and sold – fourteen times experienced. This is proof incontrovertible that her life has been hard. So – and not coincidentally – have been her owners’ lives. And what with the war, and prowling evil wizards, and decadent rulers, and crazy ones – it’s not getting any better. Not that Nym would have expected it to. Storm Siren is the debut novel of Mary Weber. The book is pure fantasy, with imaginary creatures (generally monstrous), new lands and peoples, and characters wielding otherworldly powers. Although published by Thomas Nelson, the Christian content is minimal. There are a few stray references to “the creator”, but nothing the story could not ultimately have done without. The most striking element of this book is the style. It was quite well-written, and I knew it from the first page. 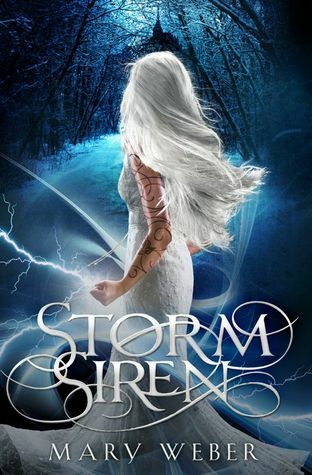 Storm Siren is one of those books that impress me with the author’s skill from the beginning; I know I am in good hands. After an intense opening sequence, Storm Siren settled into a long, relatively quiet interval that built up the characters and their world, with all its dangers. The shift surprised me, but it didn’t dismay me. I’m not as hyped for action as some readers are; I like the building and the exploring. I like introspection, I love characters, and more to the point, I liked Mary Weber’s characters. This interval is book-ended by two sequences, the second much longer than the first, that are filled with danger and action, and are both a bit too grim for me. The end was simply too dark. I see fully the virtues of the too-grim ending: the effectively-written action, the sudden turns in the story, the genuine emotion. And I was always conscious of how vividly this story is created, how skillfully it is written. So I had an odd sense, finishing this book, that my enjoyment was beneath the level of its craftsmanship. I appreciated the author’s inclusion of a brother/sister relationship, and an important platonic friendship between a young man and a young woman; the first is unusual in fiction, the second difficult. I also give her credit for bringing the modern issue of cutting into her fantasy world without it appearing forced or dissonant. Storm Siren is an imaginative fantasy, beautifully written and giving life to strange things, both wonderful and sinister. Many people will enjoy it, especially those with a taste for romance. “So I had an odd sense, finishing this book, that my enjoyment was beneath the level of its craftsmanship.” Beautifully stated, and that’s how I feel too. Great review as always!